During her home renovations last week, Toronto real estate agent Mary Nikles got an unexpected snapshot of her city’s real estate past. 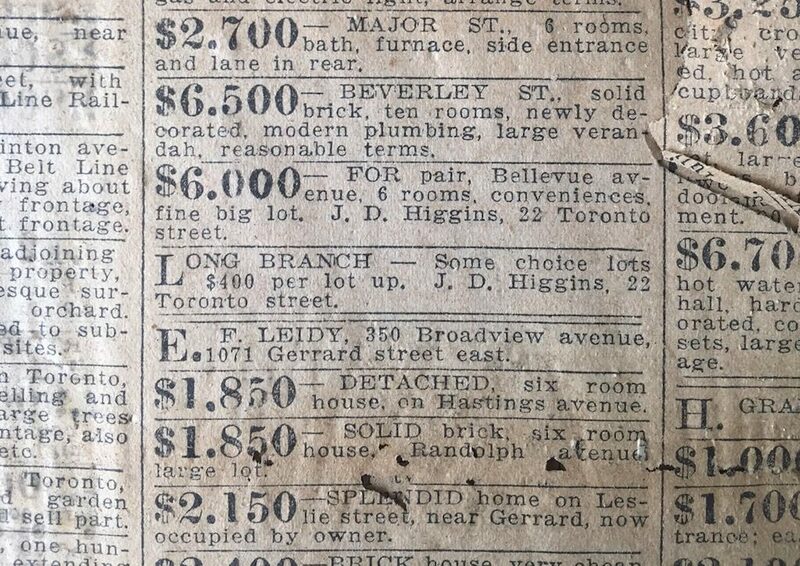 Beneath the old flooring, contractors discovered a 1911 issue of The Evening Telegram, the Toronto Star’s long-defunct conservative competitor, and with it, real estate listings from more than a century ago. “It’s one thing to see a hat advertised for 25 cents, but to see the prices for the properties,” she tells BuzzBuzzNews, trailing off. Torontonians today may be speechless when they see the home prices, too. 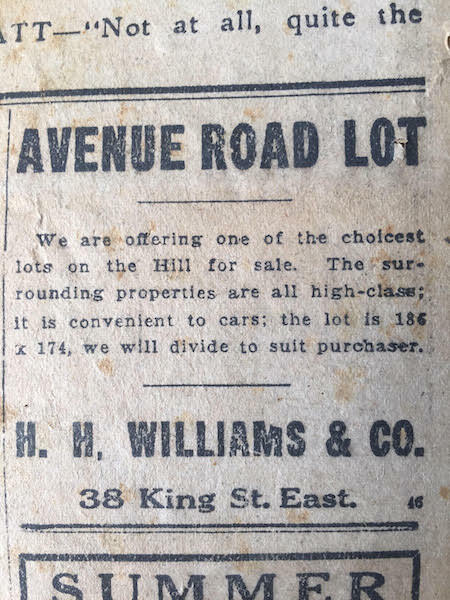 A six-room detached house on Hastings Avenue in what is now known as Leslieville was listed for $1,850 as of July 8th, 1911. Fast forward to earlier this year, and a detached home on that very same street sold for $1,555,556, well over asking, according to the Toronto Real Estate Board’s listing system. That’s slightly above the average sale price of a detached home in Toronto proper as of May 2017. Sure, inflation over a century is a factor to consider. But given the average male wage earner took home roughly a third of the price of that Hastings freehold annually — $687 a year, to be exact, according to Statistics Canada — there’s little debate Toronto low-rise housing was more affordable in the early-20th century. 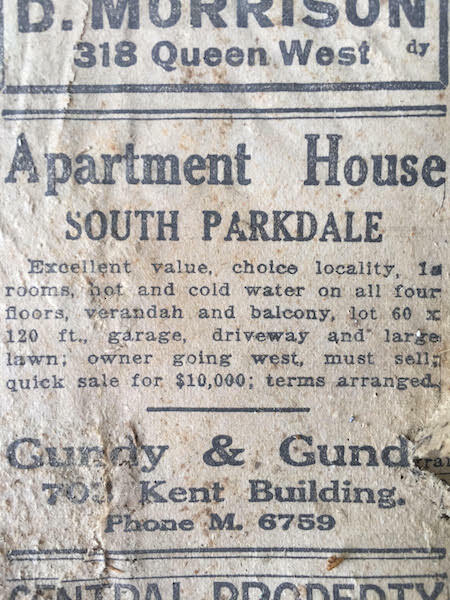 But even more than the prices (another weathered page advertises “some choice lots” in Long Branch for $400) the descriptions of neighbourhoods amazed Nikles. “There was one ad for St. Andrews Gardens in Rosedale as the cheapest lots in town, and I was like, ‘What? That was cheap at one time? Like, wow,’” she says. Today, the Rosedale neighbourhood is home to some of the most expensive real estate anywhere in the country. Another Evening Telegram listing refers to Lawrence Park in midtown Toronto as the suburbs, a classification even the most-myopic downtown dweller would be hard-pressed to defend. The ads also make for good local trivia. 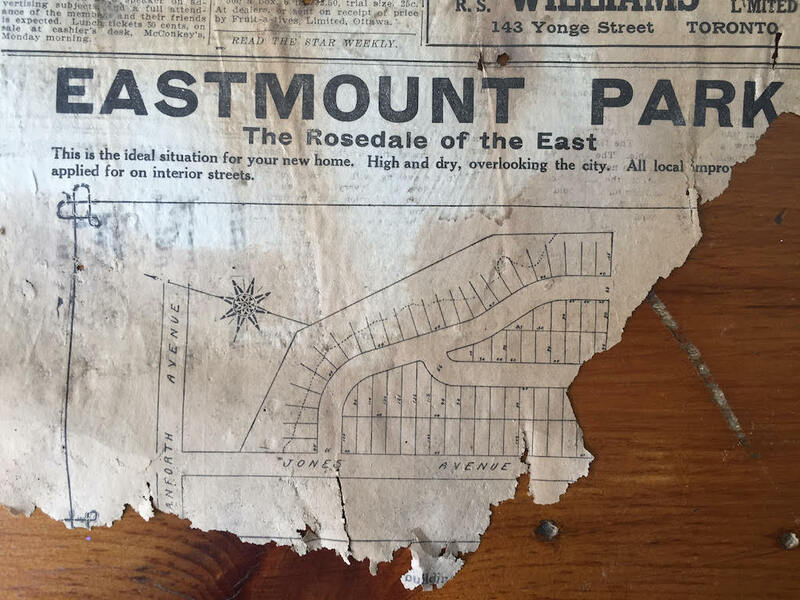 From one, Nikles learned that the Pocket, a “trendy” east-end community at Danforth and Jones was once called East Mount Park. “I thought people in the Pocket would find it amusing,” says Nikles. Check out some other pages from Nikles’ dusty broadsheet below.